In a medium saucepan heat water and butter until boiling. Cook over medium heat until mixture leaves sides of pan in a smooth compact ball, about 2 minutes, stirring vigorously. Add eggs one at the time, beating vigorously until smooth and glossy. Do not under-beat! Drop by teaspoons full onto parchment paper lined cookie sheets. Bake for about 15 minutes or until golden brown and crisp. Once puffs are cooled completely split and stuff with crab salad when ready to serve. This recipe makes about 20 puffs. 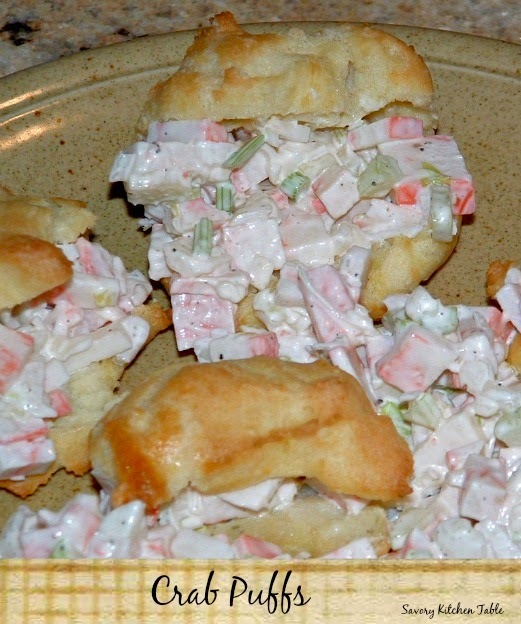 Place a large scoop of crab salad in each puff.